In this book, you will find more than a dozen fully-developed organizations to enhance your campaign, from the terrifying and secretive Cult of the Ancients - murderous servants of an evil goddess - to the noble Paladins of Corean, valourous defender of faith. 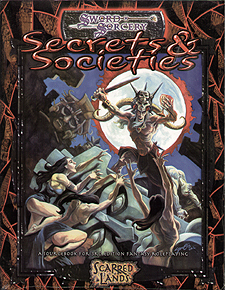 Secrets and Societies includes the history and background of each organization, statistics for typical members and leaders, as well as new spells, magic items, feats, and prestige classes unique to each organization. Learn about the foul knights who become Black Dragoons, about the alluring Courtesans of Idra whose network of spies plagues the bedrooms of kings, and learn about the strange and fearful allies of the necromatntic mercenaries called the Legion of Ash. All this and more can be found within the pages of Secrets and Societies, a sourcebook that will enhance any campaign, in both the Scarred Lands and elsewhere.